In the article they follow the case of a young boy who develops neuropathy after undergoing hip surgery. Usually neuropathy that develops after surgery is attributed to things like anesthesia toxicity, mechanical trauma, or ischemic nerve damage. In this case study the doctors ruled out all of these causes but the boy's neuropathy continued to progress. A thorough neurological evaluation was performed and he was diagnosed with post-surgical inflammatory neuropathy. This is important because we know that inflammation is an important component of neuropathy. In fact there is usually an inflammation component in most of the cases of neuropathy we treat in our office. The problem is most neuropathy patients have never had a doctor that has really investigated and treated the inflammation. In the case study presented in the journal article the cause of the inflammation was apparent, it was caused by surgery. But in other neuropathy patients the inflammation can be secondary to diabetes, chemotherapy, food sensitivities … and a number of other causes. In other words the source of the inflammation is not always obvious and is therefore commonly overlooked. In one study they summarize the role of inflammation in this way: "Diverse causes of neuropathic pain are associated with excessive inflammation in both the peripheral and central nervous system which may contribute to the initiation and maintenance of persistent pain. Chemical mediators, such as cytokines, chemokines, and lipid mediators, released during an inflammatory response have the undesired effect of sensitizing and stimulating nociceptors, their central synaptic targets or both. These changes can promote long-term maladaptive plasticity resulting in persistent neuropathic pain". The important thing is to know that inflammation is an important component of neuropathy and make sure that the initial evaluation includes an investigation of various inflammation sources. Once inflammation is ruled in as a contributing factor we must then provide natural treatments using dietary changes and specific nutritional supplement that can help lower the inflammation. This type of approach deals with root causes and ensures that a long lasting reduction in symptoms can occur. Along with our multi-facteted effective approach to dealing with perhipheral neuropathy, finding out if part of the underlying cause is related to inflammation is paramont! perform to determine the exact nature of the nerve damage. It all starts with a unique exam based in part on the Toronto Clinical Scoring System. Why? Because this exam scores the health or sickness or your nerves. Wouldn’t it be nice to objectively demonstrate where you are and how you are improving? Not just, “I feel good today” but an exam that proves you are getting better. How is this accomplished? Through the unique combination of clinically proven therapies, including the Cutting Edge MLS M6 "pain blasting healing laser". First you should know that we address each person as an individual using both metabolic and neurologic strategies. This is what we mean by “no stone is left unturned” when it comes to helping our patients. You are not looking to try an old previously unsuccessful treatment again…you want relief…you want results! There are 5 key elements … or what I like to call ingredients, to properly heal a damaged nerve and create real and lasting relief from neuropathy. Just like a recipe if you leave out an ingredient or don’t put the right amount of the ingredients you don’t get the result you are looking for. At Johnson Chiropractic Neurology & Nutrition we have combined the five key elements required to address the damaged nerves in your legs and feet and/or arms and hands to provide true and lasting relief. 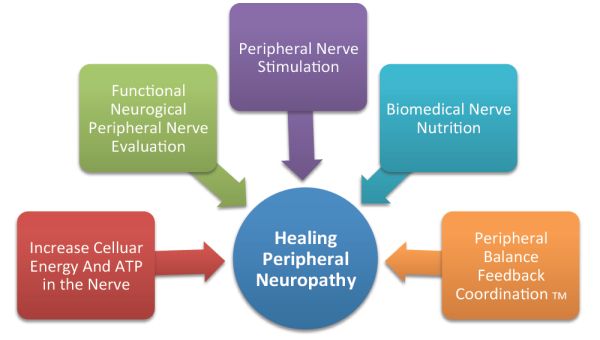 We have developed a proprietary system that combines these elements which we call Functional Peripheral Nerve Restoration™.